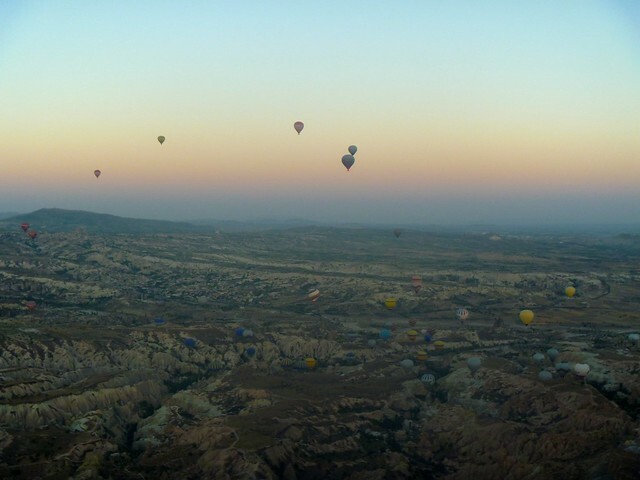 However, everyone I met in Göreme had done it and raved about the experience. Absolutely no one regretted spending the money on the trip, so I figured that said something, especially since backpackers are a notoriously tight-fisted bunch. So I decided to stop grumbling and just cough up the money. And guess what? It was totally worth it. 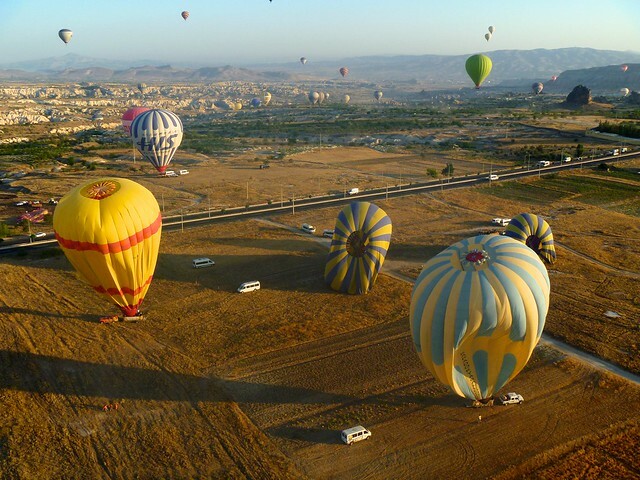 The Kapadokya Balloons shuttle picked me up at my hotel promptly at 4:30 AM, then did a quick drive around the main drag to pick up a few others before bringing us to their office. There we were given “safety cards” with our pilot’s name on them, then shown next door to a lounge area to wait. It was quite a fancy setting — I thought for a moment that we were in the lobby of a 4- or 5-star hotel, but no, apparently it all belonged to the balloon company. They served us a light breakfast of pastries, coffee, and tea, and then we hopped in our assigned vans for the quick ride to the launch site. 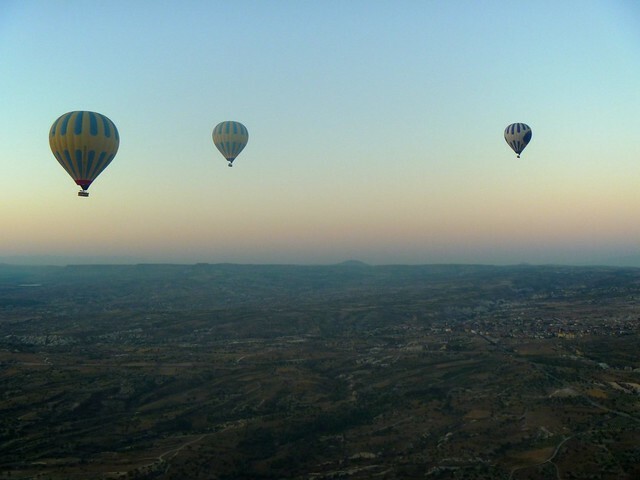 It started gradually getting lighter as we drove, and we got our first glimpse: balloons, silhouetted against the hillside, huge mounds rising out of the ground as they were slowly filled. We drove past them all to a further area where just our company’s balloons were. As we hopped out of the van I ran backwards, trying to get pictures of the crew filling the balloons, but they were all yelling for us to get in the baskets so I had to abandon that idea pretty quickly. I guess the balloons get hard to control and keep on the ground once they’re filled. So we all hopped in — there are footholes on the side of the basket to help climb up — and the crew all took photos of us as they were still struggling to hold the balloon on the ground. Then we were off! It’s such a gentle ride that I almost didn’t realize we were lifting at first. After we were hovering a few feet in the air, the crew untied the ropes that were anchoring our basket to one of their fleet of Land Rovers. Then we were really off! We lifted up little by little and floated over the valley. I had a sightly panicky moment early on when we were still gaining altitude and were approaching some particularly tall, pointy rocks — it really didn’t look like we were going to clear them, but of course we did. The rest of the time wasn’t scary at all, just beautifully thrilling. It was almost daylight already when we lifted off, but maybe ten minutes or so into our flight we all looked back east and saw the sun rising slowly over the horizon. It was glowing red-orange and much more dramatic than most of the sunrises I’ve seen where the sky just sort of gradually gets lighter. It was as colorful as a sunset… really gorgeous. We flew for about an hour and twenty minutes. I wish it had been a little longer — I had been talking the day before with an English guy who had gone with the same company and said his ride was more than an hour and a half, but I guess it depends on the wind conditions. In any case, it was enough. 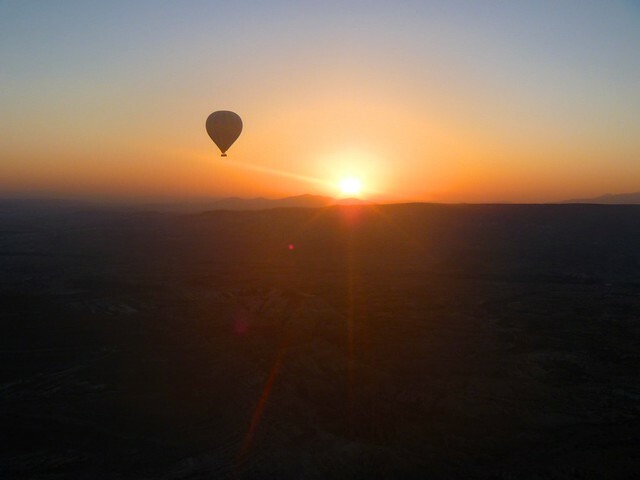 Our pilot spoke great English and occasionally pointed out various sights as we flew over them, but mostly he focused on steering, chattering quietly on his radio to the other balloons, and let us just enjoy the ride. We had a bit of a rough landing. 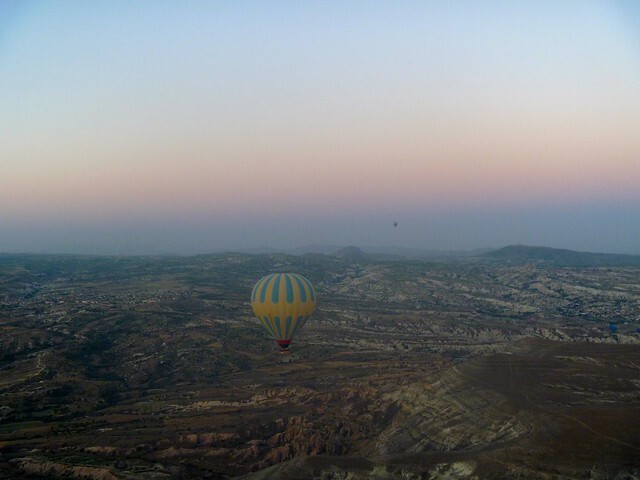 We had flown up quite high, around 900 meters, and while it felt totally smooth as we floated through the air I guess we had picked up a lot of speed. So when we started to land, we came in a little hot. 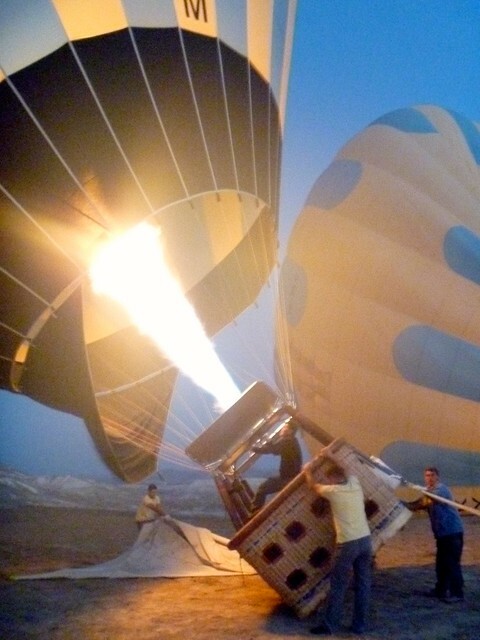 We had been briefed before liftoff on the “landing position” we would all have to take: facing the back of the balloon, holding onto the rope handles, and squatting almost into a sitting position with our backs resting against the divider walls. However, we were not briefed on how it would actually feel when we touched down! We hit the ground hard and were all knocked about a little, our hips and knees slamming into each other. But it was more surprising than anything, and we were all laughing. The ground crew ran to hold up the side of the basket so it wouldn’t tip over and straightened us up. Once we all climbed out of the basket, the crew inexplicably started decorating it with flowers and greenery (I guess they thought it would add something for photos?) and set up a table for drinks and snacks. They served us champagne and cherry juice and passed around trays of pound cake. 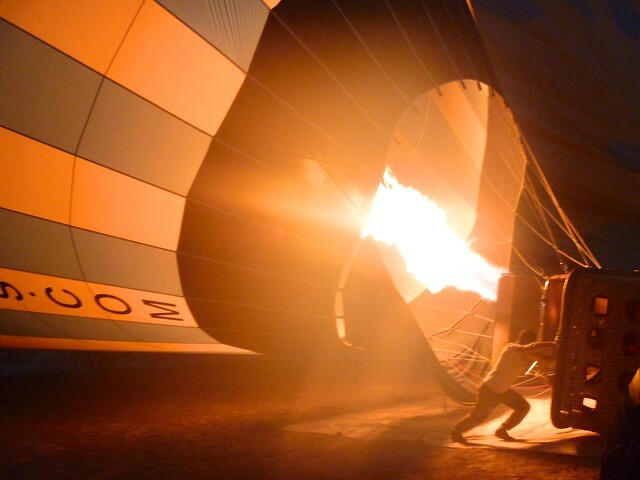 Apparently a lot of the people in our balloon were teetotalers, so those of us who did drink each got plenty of champagne refills — the perfect thing at 7 AM, right? 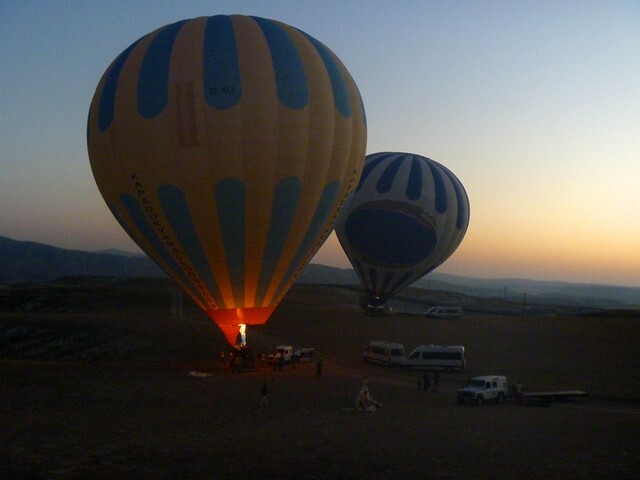 Then the crew loaded up the balloon and basket onto a trailer while we all piled into a van and were driven back to our respective hotels. I was back in bed by 8:30 and passed out immediately, sleeping until nearly noon.